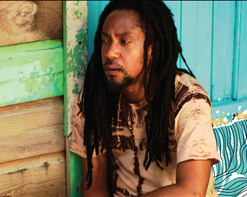 Hailing from St. Lucia, Taj Weekes enjoys the mystery that surrounds his presence. In full Bob Dylan style, Weekes travels the land singing about the things he sees around him, touching upon important social issues in hope of inspiring conscious thought and provoking conversation with his band Adowa. This animated video only hints at the gruesome story that lies behind the name but presents the issue so that those who want to know more may seek it out themselves. For many, this song and video will be the first time they will hear of the Janjaweed and the devastation they have been perpetrating in Africa for nearly a decade. The video is safe for broad viewing as it utlizes a metaphor of evil seeds spreading across the landscape rather than blatant violence. Weekes is aware that you cannot solve violence with more violence, and hopes to educate in a respectable way. The song itself overflows with harmonica, violin and cello. Weekes’ hoarse, soulful, almost feminine voice delivers memorable melodies over comfortable roots rhythms and perfect Beatle-esque harmonies. We are thrilled to bring you an artist that is not only dedicated to his craft, but has story to shine along with it. We’ve got Taj Weekes goodies here at the office, so be sure to fill in your requests for any giveaways and contests. Weekes is currently on a massive tour across the country in support of A Waterlogged Soul Kitchen during the summer and into the fall, so don’t be afraid to let us know if you’d like to attend a show or do an interview with the artist. For more info, call Andy Gesner at 732-613-1779 or e-mail us at info@HIPVideoPromo.com . You can also visit www.TajWeekes.com to find out more about Taj Weekes & Adowa and tour dates near you.